34 sketches in New Zealand for Mr Charles Abraham. Ref: Caroline Abraham, Sketchbook, Sir George Grey Special Collections, Auckland Libraries, 3-111. Mrs Caroline Harriet Abraham is chiefly remembered as a recorder of the early colonial New Zealand landscape. Her cousin was the wife of Bishop Selwyn and she herself married Selwyn’s good friend Mr Charles Abraham. During the first half of their New Zealand residence, the Abrahams lived mainly at St John’s College where Charles was Principal. They moved south in 1859 when he was made inaugural bishop of Wellington. The dedication on the title page of the sketchbook is for this to be given to her son (also Charles Abraham). The sketchbook was donated to the Library by family members in December 1947. As the images show the sketchbook is very fragile, so it’s great that these watercolours have been digitised. Most of the watercolours are of Auckland but the sketchbook also includes detailed plans of St. John’s College and scenes from Wellington, Taranaki and Waikato. These were painted in the early to mid-1850s. 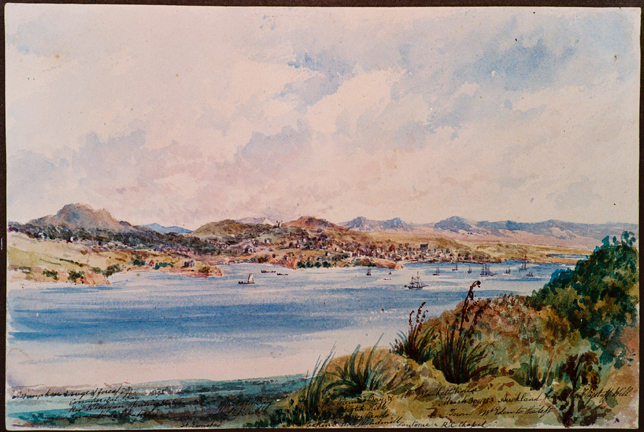 Ref: Caroline Abraham, Manukau Heads and Mangere from Otahuhu, 7 April 1854, Sir George Grey Special Collections, Auckland Libraries, 3-111-15. In the early 1850s there were only about 9000 people living in the Auckland metropolitan area, the scenes provide valuable pictorial record. Ref: Caroline Abraham, Auckland from Flagstaff Hill (Mt Victoria), 30 March 1853, Sir George Grey Special Collections, Auckland Libraries, 3-111-26. 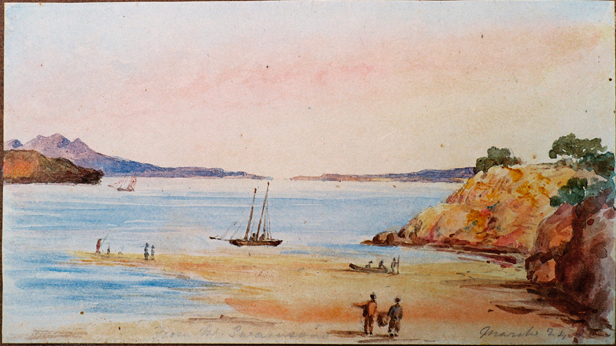 Not much of the city is still recognisable from her 1853 sketch of Auckland; even the shoreline has since changed. The view sweeps across the Waitematā Harbour with the Waitakere hills in the background. The descriptions include contemporary translations of Rangitoto – "heaven’s blood", Kohimarama Bay – “the focus of light” & Motutapu - “Holy Island”. 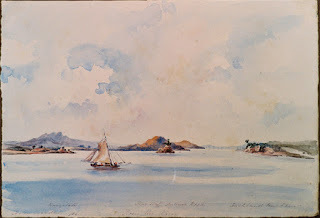 Ref: Caroline Abraham, Auckland Harbour from the Waiou showing Rangitoto..., Easter Monday 1853, Sir George Grey Special Collections, Auckland Libraries, 3-111-25. 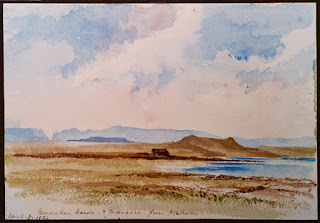 In The far off and the near Virginia Browne-Wilkinson quotes extensively from Caroline Abraham’s letters and notes, “her painting is never mentioned in her letters (p.113).” But even if Abraham never talks about her painting we can see the country that she writes about in the watercolours. 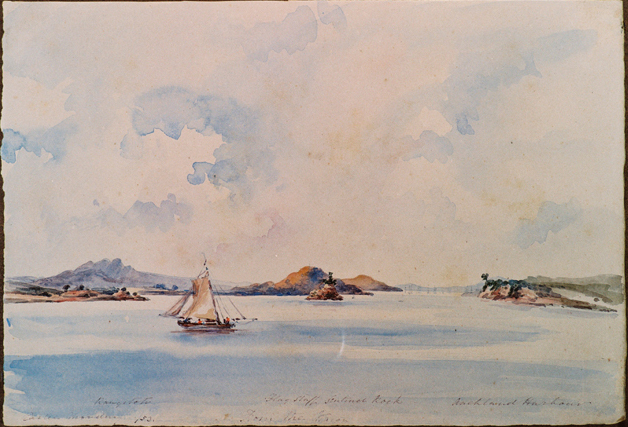 Ref: Caroline Abraham, Entrance to Coromandel Harbour, April 1852, Sir George Grey Special Collections, Auckland Libraries, 3-111-12. Ref: Caroline Abraham, Waitemata Harbour from Mr Swainson's in Judges Bay, 1850s, Sir George Grey Special Collections, Auckland Libraries, 3-111-6. 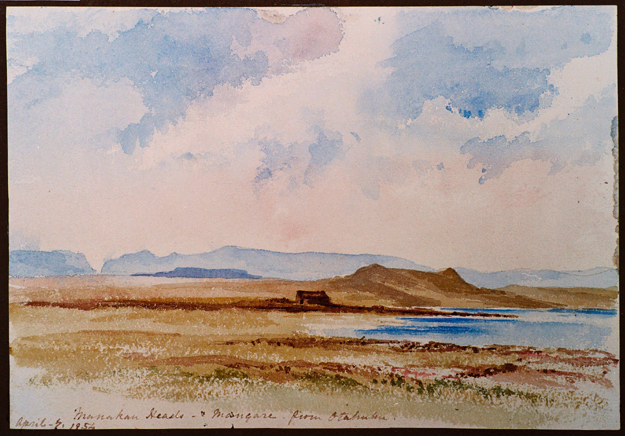 2 of Abraham’s watercolours were selected in 1959 for the Colonial Auckland exhibition curated by Una Platts at the Auckland Art Gallery. 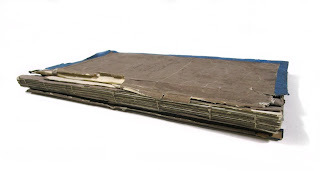 It was a great success and the Free Lance reported at the time thousands of people had attended the exhibition. 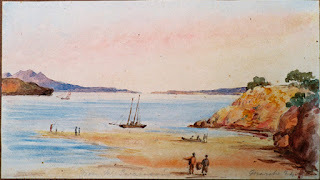 Auckland Art Gallery now has a further 21 of Abraham’s watercolours of the Auckland area. Great post Andrew! 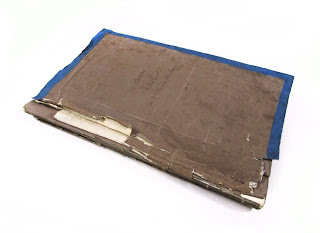 I liked reading the excerpts from her letters and neat to show the outside of the sketchbook as well as the stellar paintings.